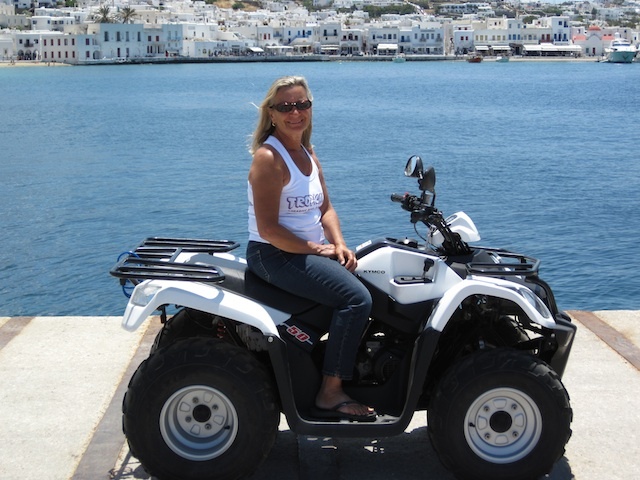 Our trusty ATV in Mykonos. That is the main port in the background. Captain Steve at the top of Delos, standing where Apollo stood. That is one big Apollo torso on Delos! 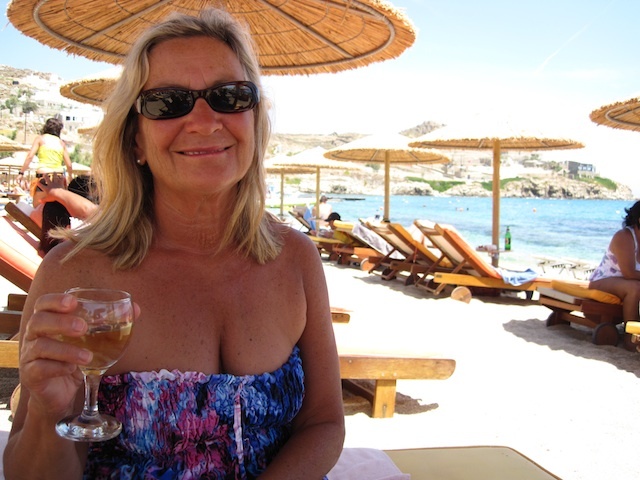 Maria enjoying a relaxing day at Paradise Beach on Mykonos. The lions of Delos with ruins as far as the eye can see. 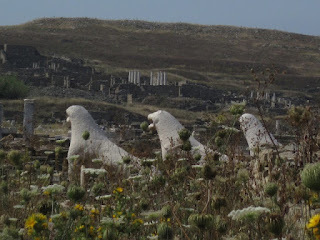 More ruins are behind us on Delos. The marina at Mykonos. Aspen is on the back left with the other sailboats. Too bad they don't have electricity, water, bathrooms or any other conveniences in the marina! Mykonos! Yes, where Aristotle Onassis and Jacqueline Kennedy Onassis played and partied day and night with the rich and famous from all over the globe. Today, Mykonos has lost the number 1 ranking to Ibiza so it is only number 2 in the world as the most famous place to party. 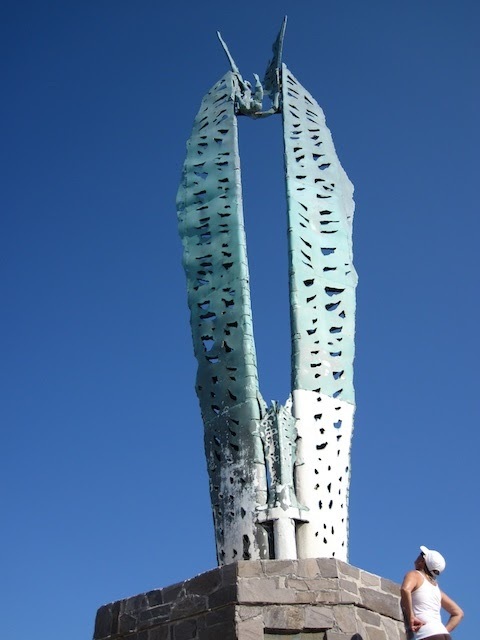 So we fit right in – yea right! Unfortunately the parties don’t begin until 2 AM and Captain Steve gets up to run before daylight so we could have gone to the festivities but decided not to. Our first day on the island we rented a motor scooter but the roads are so steep and narrow that Maria would have had to walk up the steeper hills while Captain Steve struggled to ride up them. The scooter was traded in rather quickly for an ATV with much more power. The beaches are spectacular and there are chairs and umbrellas on every square inch of them. You rent your piece of sand for the day at prices that are actually cheaper than in the Caribbean. Then you eat at the restaurants and have gyro sandwiches and your choice of refreshments. The sandwiches cost $3 but the drinks cost $13. Hmmmm. At around 4 pm each day the music starts and people exit the water to dance. This is the early party that ends around 7 PM. Everyone rests and eats dinner until 2 AM when they return to their favorite dance spot and parties while watching the sun come up. This cycle is repeated day after day throughout the summer. We wondered how anyone gets any work done? Well, for the most part, they don’t. There are so many days off and delayed openings of stores that it boggles your mind. Of course the grocery stores, restaurants, bars and tourist places are always open so that keeps everyone mostly happy. Our ATV worked great, helping us explore the popular and remote beaches on Mykonos. 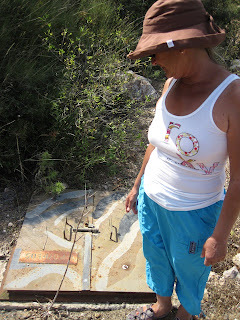 Maria didn’t have to walk once, although one road was so steep that the ATV nearly didn’t make it. In the end we persevered and had a great time. 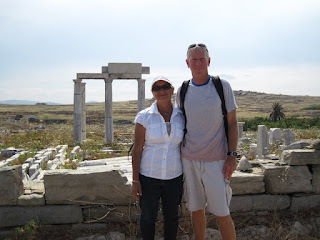 From Mykonos we took a 20-minute ride on a tourist ferry that visits the legendary island of Delos. Delos: the island where Apollo was born. 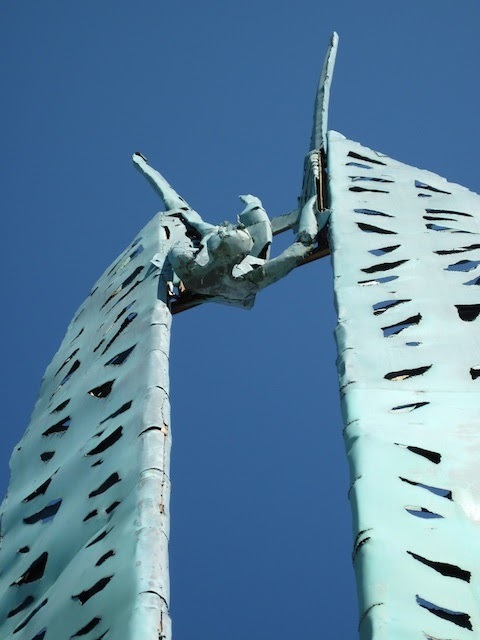 This is the pinnacle of Greek mythology – visiting the birthplace of Apollo. The island is barren and windswept today with monuments to Apollo everywhere on the blindingly white island. The island is so white because of all the marble that was used for the monuments to honor Apollo. There is no shade so you must be prepared for the high intensity light and heat. The ruins are extensive and you could wander for hours among them. 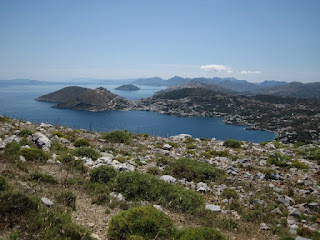 This island was so special to the Greeks that no one was permitted to die on the island way back then. Special people like priests did live on the island but if any of them fell ill they would immediately be taken off the island so that they could die on the adjacent island. 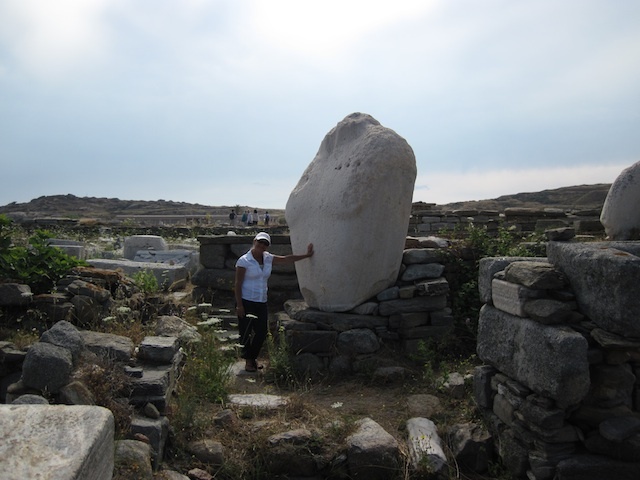 Delos was that sacred! 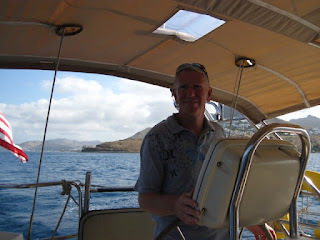 The winds turned more in our favor so we pointed Aspen south to Naxos, some 25 miles away from Mykonos. 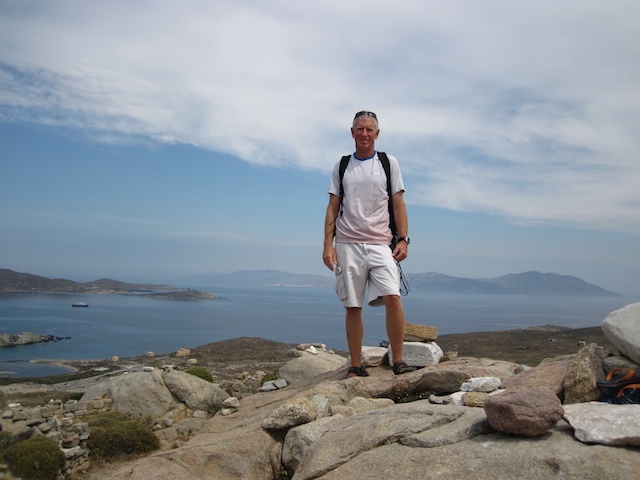 Naxos is a large island where crops are actually grown, instead of just encouraging the beautiful people and jet setters! 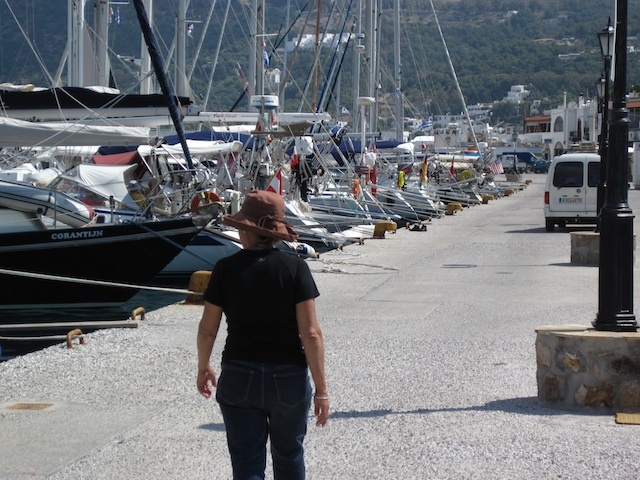 However there are tourist shops, great restaurants and white sandy beaches to explore from our berth in a nice sheltered marina. We finally were able to tie up in a marina and get water and electricity, something that we have not had for 10 days. Of course we have battery power on Aspen and water but to be plugged in with unlimited power and water was a true luxury for us! The winds increased significantly but their direction was very favorable for us so we set sail to yet other distant Greek island. Ios is another windswept hunk of rock with very little in the way of vegetation. However the beaches are nice and the water is clear and swimmable, even though the water temperature is better for polar bears than humans! Our stay at Ios did not last long as the remnants of the demonic island Santorini, or as the Greeks call it, Thira, next appeared before us between the waves. Santonini: killer of the Minoan Civilization and destroyer of Atlantis. Santorini is an active volcano that last erupted in 1956. But that burp was hardly anything compared with what happened in the ancient past. When Santorini blew apart in 1500 BC it erupted with a force much more powerful than even that of Krakatoa in Indonesia, which changed the climate on Earth for an entire year. Santorini not only changed the climate but it changed civilization as it once was. And what of the mythical Atlantis? What is left of Atlantis is sitting somewhere beneath the sea and the cause of even its’ destruction is thought to be from Santorini. Civilizations ended, monumental cities vanished and the Earth changed - all because of this volcano. In awe once again, we sailed directly through the caldera of the demon (isn’t that dramatic?). Santorini didn’t scare us but brought thoughts of how powerful nature always is. The water in the caldera is full of sulphur and other nasty chemicals so we did not stay long. Under full sail Aspen ghosted across the huge abyss and existed on the far side of what was once the top of the volcano. Whew!!! Let’s get out of here! Crete lies on the horizon. 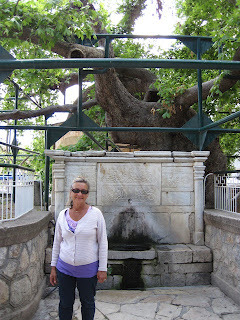 Maria standing beneath the tree of Hippocrates on Kos - the spot where modern day western medicine first began. Hippocrates lectured beneath this tree to his students about using scientific methods to treat people. An Italian WWII prison on Leros. Maria looks a bit apprehensive? Tunnels that the Italians built on Leros during WWII. They are everywhere on the island. The cloudless, well almost, Greek sky above the deep blue Aegean Sea and the island of Leros. Greek Orthodox Church out on a small island in Leros. Let's hope the tide doesn't come in quickly! 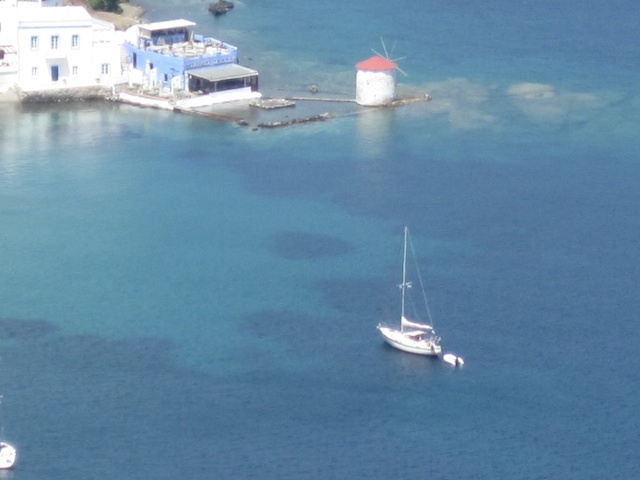 The azure blue waters of the Aegean Sea with a typical windmill and an anchored sailboat. 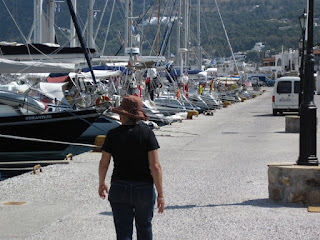 Ikaria, Greece with Aspen the only sailboat in the small harbor. Maria is mesmerized by the sight of Ikaria falling with his melted wings. Patmos - Where the St. John, the disciple of Jesus, lived in exile for 5 years and wrote the final chapter of the Bible. A typical dock where we secure Aspen. 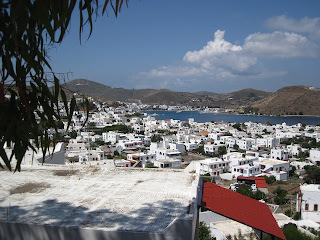 This one is at Patmos. You can see Aspen toward the far end with the only US flag flying. Maria walking in the steps of the pilgrims to the Cave of the Apocalypse. Captain Steve standing where St. John laid his head (the lowest silver round frame behind the railing) and he is touching the hand hold that St. John used to raise himself up from his bed every day. The Holy Trinity according to St. John. 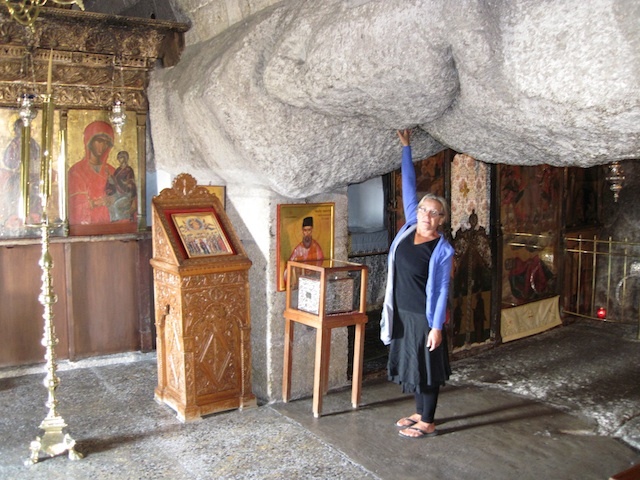 Maria is touching the exact spot where God spoke to St. John and gave him the words to the last chapter in the Bible - Revelation (The Apocalypse). There are so many Greek Islands that it is difficult to decide where to visit first. So we let the wind help us decide. That simplifies things a little bit and Aspen likes to be pampered too! We crossed from Turkey to Kos, Greece and checked into the European Union (affectionately known as the EU – the same organization that Greece wants to leave, along with the currency of the Euro). Anyway, Kos is a tourist island with a marina that is a nice place to be in order to explore the island. Maria got her hair done so that made her very happy. They have hair stylists from Paris in Kos and she really liked their work. Two days after stopping in Kos the marina told us that we could not stay any longer because all of the charter boats were due to come back so we would have to go. Oh well. Next stop was Leros, where the Italians took over the island, and Greece, during WWII, and built all of the buildings that we see today on Leros. 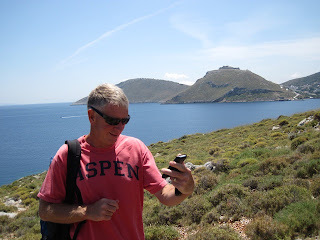 There are military ruins everywhere because Leros was Italy’s biggest port in Greece during the big war. 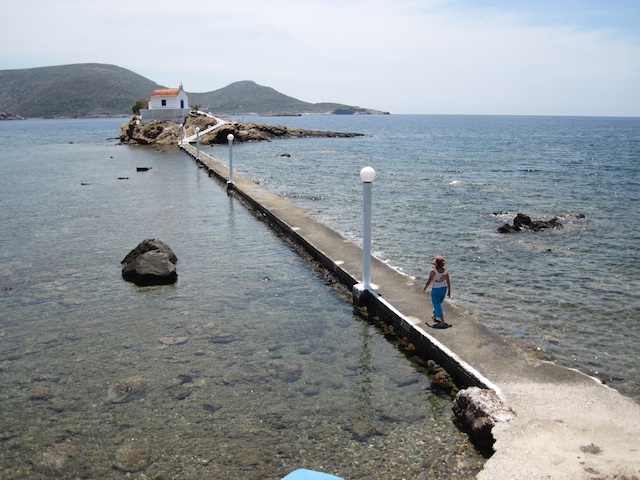 There is still a forbidden area across the bay from the tiny marina that the Greek Navy still uses. We tried to get in but they said NO. 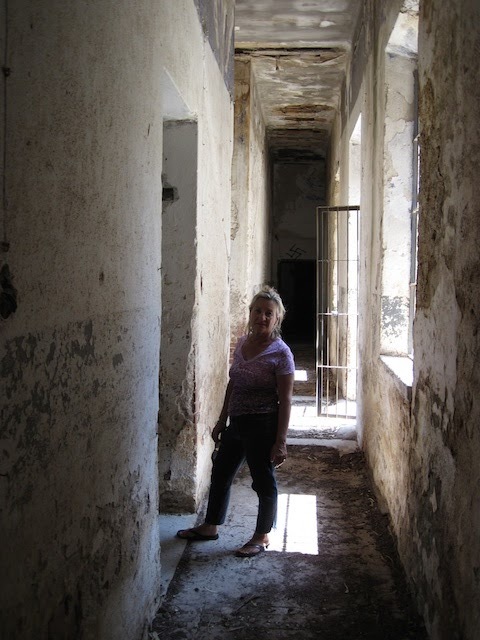 So instead we visited an Italian prison that is in ruins and several bunkers, gun emplacements on high points on the island and tunnels. Leros isn’t a very big island so the locals have a bad case of island fever. 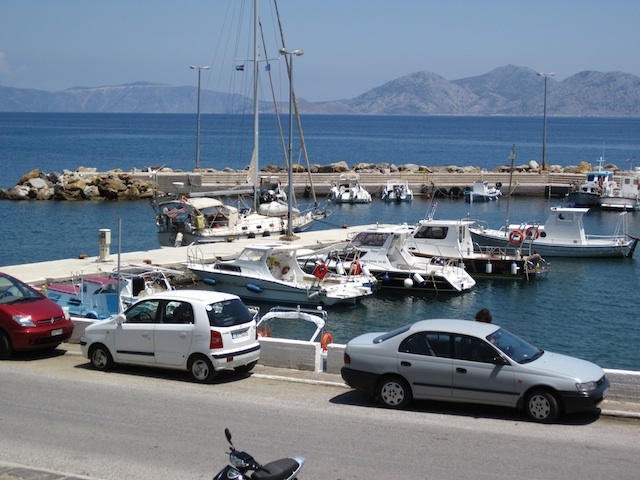 They constantly drive up and down the street behind our boat that is tied to the main concrete wall in the town of Lakki. The main street is about 1 mile long and they drive from one end to another all day and most of the night on their scooters that don’t have mufflers. At least they keep themselves entertained! 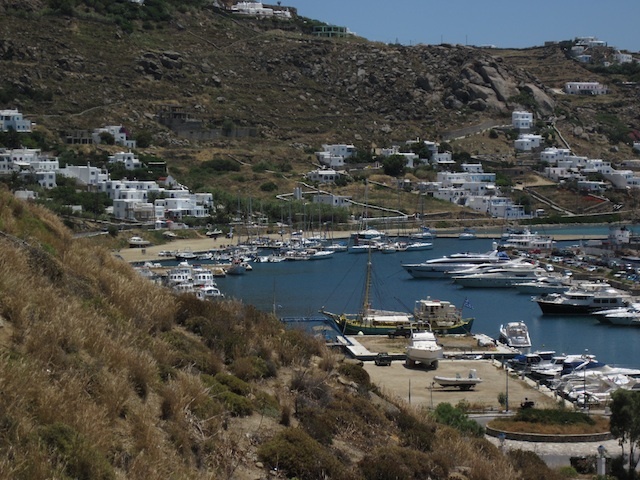 We had south winds so our next stop was Patmos. Now this island was really amazing. Heathen Steve was educated once again when we read that the Romans exiled St. John (yes, THE St. John, the closest friend of Jesus) to the island and he lived in a cave known as the Cave of the Apocalypse. 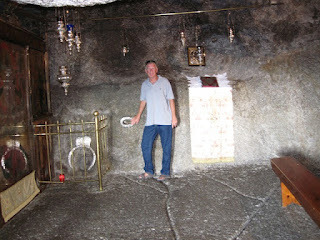 This was where St. John wrote the final chapter of the Bible, Revelation (or as it is also known, the Apocalypse). We were able to visit the actual Cave of the Apocalypse and as usual we arrived early before the throngs arrived. There was a donkey path from the main town where Aspen was docked, that wound up and up into the steep mountains. This is the same path that the pilgrims walk when they visit the cave. Ascending over 1,000 feet we arrived outside of the church that has been built around the cave. We paid $2.50 to visit the cave and preceded to the steps that led down, down, down until we stood outside the entrance to the Cave of the Apocalypse. The inscription above the entrance read, “As dreadful as this place is it is nevertheless the house of God and this the Gate of Heaven”. Ummm, that put us in the right frame of mind with something that was written nearly 2,000 years ago! 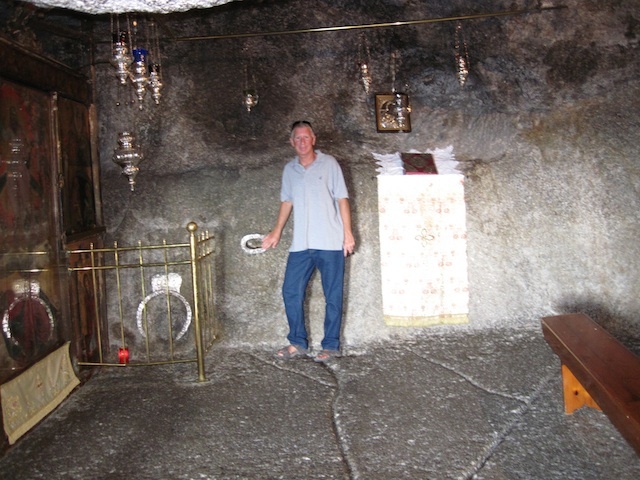 I don’t intend to belabor this visit BUT, I have to explain that inside the cave where John wrote the Apocalypse there are three cracks on the low cave ceiling that we could barely stand under. These 3 cracks joined together at a single point where we put our hand. St. John said that this juncture was the Holy Trinity and at this exact spot God spoke to him through this Holy Trinity and gave him the words to the final chapter of the Bible. 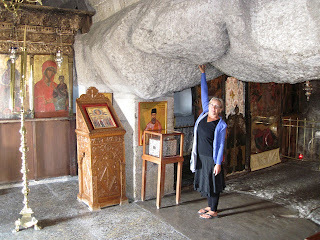 We never expected that Greece is as biblical as it is but this was a fantastic visit to the Cave of the Apocalypse and as astounding as it gets. Oh yes, the restaurants and little shops on Patmos were a lot better than those on Leros! Again the winds were blowing lightly from the south so we pushed further north and arrived at Ikaria. Do you remember where this island got its’ name? Obviously, it was the Greek legend of Ikaria! The legend was that Ikaria crafted a set of wings from feathers and wax in order to escape Crete. Unfortunately Ikaria strapped on the wings and flew a little too high and close to the sun where his wings of wax melted. And you can guess where he landed – right on the island of Ikaria of course. They have a nice statue honoring this legend at the entrance to the small harbor. Aspen was the only sailboat in the harbor because very few sailboats stop here. 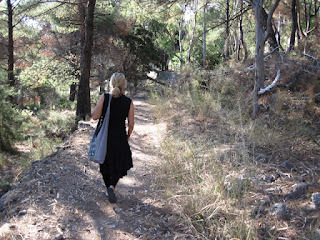 Ikaria is not a very touristy island and it is much too steep to grown any crops. But it was a nice stop for us and gave Aspen a great wind angle to our next island, Mykonos. Mykonos, the party, party, party island that Onassis, Jackie O and the jet-set crowd made famous! Stay tuned for this one!